This week, the Federal Trade Commission (FTC), the Centers for Medicare and Medicaid Services, and the Office of the Inspector General in the U.S. Department of Health and Human Services (HHS) discussed legal issues related to accountable care organizations (ACOs) during a public workshop(www.ftc.gov) in Baltimore. As promised in the meeting agenda, an FTC panel debated circumstances under which independent health care providers participating in an ACO could engage in price point negotiations with private payers without running afoul of federal antitrust laws that prohibit price-fixing. Also, panel participants explored different ways in which the HHS secretary could exercise waiver authority or create new exceptions and safe harbors related to the physician self-referral law, the federal anti-kickback statute, and the civil monetary penalty law, for the purpose of encouraging the creation and development of ACOs. The AAFP submitted comments that were included in the meeting record, and the Academy will continue to track the progress of the issues discussed. As I listened to the workshop and as I have thought about it since, my thoughts had less to do with how ACOs might be facilitated and more to do with what they might mean for coding by and payment of family physicians. Regarding coding, I am inclined to think that ACOs will de-emphasize the importance of procedure and service coding while heightening the importance of diagnosis coding. My reason for thinking so is that I expect ACOs will be paid on something other than a fee-for-service basis and, in turn, will pay physicians accordingly. When payment is made, for example, on an episode-treatment or global capitation basis, coding of each individual service becomes much less important than it is under fee-for-service. At the same time, appropriate risk adjustment of global capitation or delineation of episodes of care will depend, at least initially, on correct and complete coding of each patient's condition(s), which is all about diagnosis coding. Regarding the payments themselves, I am optimistic that family physicians can do well in an ACO model of health care delivery. Family medicine has long touted its value, essentially arguing that nobody can do it better for less. 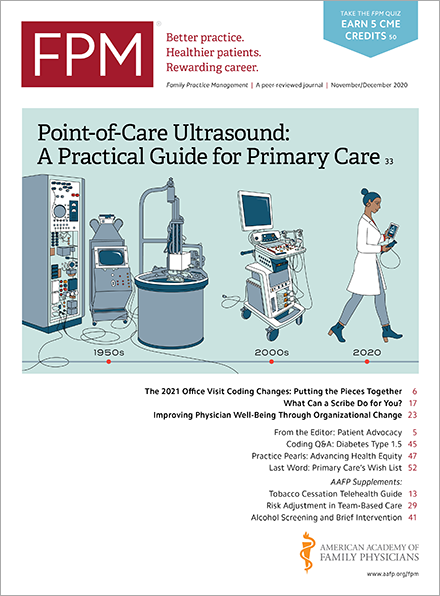 ACOs, according to proponents, are all about cost-effectiveness, which suggests that they will depend on family physicians to succeed. That dependency should create leverage for family physicians to be paid at a level that is commensurate with the value that they bring to the ACO. Of course, this assumes family physicians exercise this leverage and choose to play a key role in the formation and ongoing governance of ACOs. Admittedly, this is all a bit of crystal ball gazing on my part, and as my 401(k) results will attest, crystal ball gazing is not my strong suit. As in most matters, only time will tell, but I'd like to hear your predictions. What do you think?